Can you tell us about your works for Dancer’s Choice and your inspiration? Colleen Buckley in rehearsal for “Shepherd’s Boy.” Photo by Mimi Tompkins. Colleen: Mine is more classical – pointe shoes, pink tights. It’s inspired by classical ballets, where there are always mythical creatures running around and also a little bit of what Ib does, which are ballets that are story based but also pushing the boundaries of what that looks like. It’s called Shepherd’s Boy and it kind of has a loose story. There is a boy who is the son of a shepherd and his only prospect is to be a shepherd, so he goes out into the woods and runs into all of these mythical creatures which are the women, and they represent all the things that he could be that are better than a shepherd. He sees Kaelyn (Magee), who is the leading lady, and he wants to get to her and be more than a shepherd but he can never capture her, so he is just doomed to be a shepherd. My costuming is very purple – I guess the story is my interpretation, so the audience can interpret it how they want. They aren’t necessarily going to be able to tell that he is a shepherd because he is wearing a purple top and grey tights and the ladies are wearing long purple dresses. Lydia: My piece is contemporary, it’s called Brick By Brick and the inspiration I drew from is a bit dark but hopeful in the end. It’s the idea of a person going through a big tragedy in their life, whether it’s the loss of a loved one, losing your home to a natural disaster, going through horrible events like sexual assault – pretty much anything really bad that completely changes a person and who they are but then afterwards finding out who you are and what that journey looks like/means to you. I feel like when that happens to someone, you are pulled in so many different directions between people trying to help you, but also trying to show you this is the way you should be but in the end it’s ultimately you figuring it out. You see a lot of push and pull in that aspect and each person coming into their own. The first piece is four people and after that there is a 2nd movement that is just a solo with Kate (Loxtercamp). I wasn’t originally planning on doing that but I finished the first piece early and we had so much time that I ended up tacking it on. I am really happy I did because it ends the piece on a bit of a more hopeful note. They will all be wearing street clothes and wearing socks, the colors are all fairly muted but each person has a red accent – kind of representing their own individual tragedy, so one person has red socks, another person has a red headband – but it’s really showing that scar. Can you talk about your choreographic process? Lydia Relle in rehearsal for “Brick By Brick.” Photo by Mimi Tompkins. Colleen: This is my first time choreographing. I am a little bit of a control person, so I spent a lot of time by myself in the studio listening to the music and coming up with the choreography. Some choreographers like to go in the room with the dancers and experiment with them in the studio but I felt more comfortable preparing what I wanted them to do in advance and then bringing that into the studio and from there being flexible with what actually works. Overall, there were some little changes because of the spacing and then things also look different when you are having 4 people do something compared to when you have just yourself. But in the end, it’s similar to what I started with when I was on my own, especially since we are working on our own time and dancers are coming in extra from their set schedules to put this together. I wanted to make the best use of time and I felt that would be by coming in really prepared. Lydia: This was not my first time choreographing, but it’s only my 2nd time. My first piece was for a similar show in San Antonio for my old company, they did something almost exactly like Artist Relief Fund. It was recently reprised for a contemporary dance festival in Seattle called Chop Shop. This time was a lot different than the last. The first time was with two dancers that I knew very well so I felt more comfortable and I did a pas de deux which I was also more comfortable choreographing. This time around I didn’t know the dancers as well when I first started choreographing. As I went on, I started to feel a lot more comfortable with them, so it makes a difference. I mean, you’re being vulnerable when you choreograph, so to be able to be in that safe space is important and I also wanted to challenge myself this time by doing a group piece and a solo. I come into the studio with some ideas but I like to collaborate so the movement looks organic with the dancers. What is it like choreographing on top of learning other pieces like Serenade for Dancer’s Choice which is already in addition to your regular schedule as company dancers? Lydia: For me it’s been pretty easy, I felt like they were pretty separate. I started choreographing really early – around the layoff after The Sleeping Beauty, because I did not want to put myself in a stressful position. 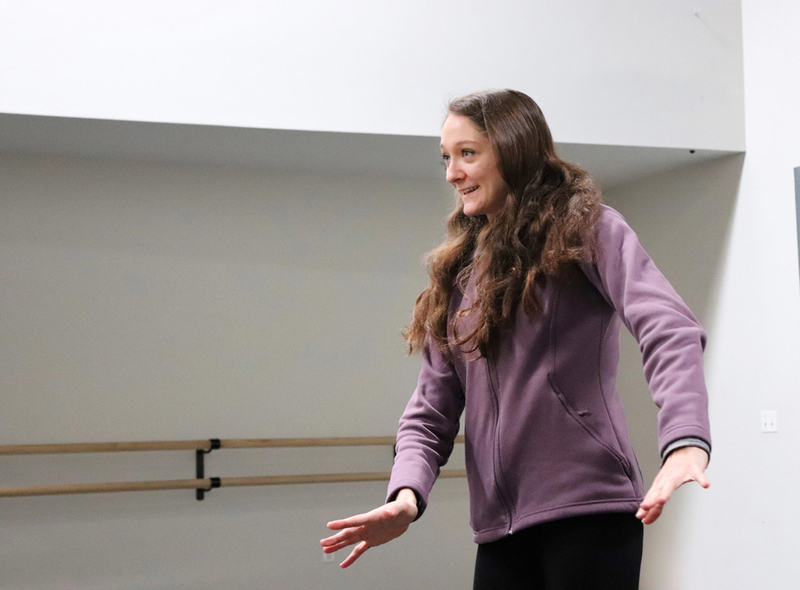 I also didn’t want to put that stress on my dancers, and all of the people in my group were accommodating – coming in and just being open with their schedules. Above everything, I really wanted to avoid being in a crunch more because I feel like that’s when you become forceful with your creativity. Colleen: Thankfully, Serenade is a ballet I have gotten to do before, so it’s been nice to come back to it and Maria (Simonetti) set it really well so there hasn’t been so many questions. Plus, I feel like many people have done the ballet before so it came together really easily. For my piece, I started working on it by myself at the beginning of the season, but I didn’t start working with the dancers until January. 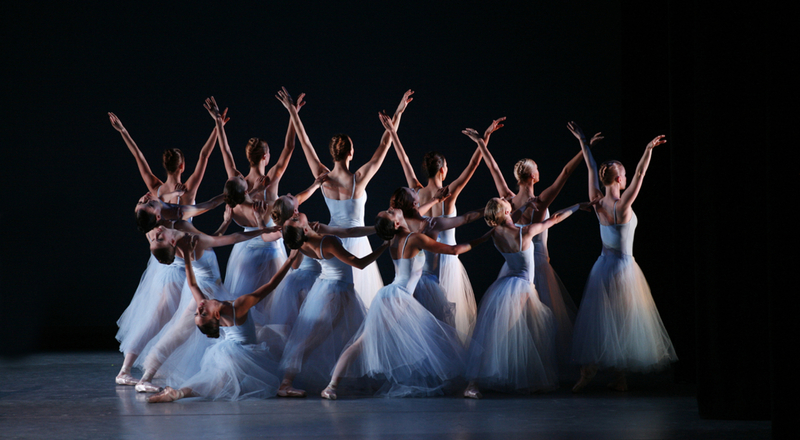 Ballet Arizona dancers in “Serenade.” Choreography by George Balanchine. Photo by Rosalie O’Connor. © The George Balanchine Trust. Why should people come to Dancer’s Choice? Lydia: I think it’s really cool that we have so much dancer choreography in it. As audience members, you really only get to see what we as dancers get to dance as part of the season which still offers a fair amount of vulnerability and creativity but when you come to Dancer’s Choice, and see what we have to choreograph, you truly get to see the inner workings of someone else’s creativity and their brain. You get to see a whole new side of us as dancers compared to what you have already seen on stage and you get to know the company in a different way. Also, there is something to be said when you get to do what you want to do. We are all here because we love to dance but then, when you get to dance what you want to dance, there is something extra special behind that. Colleen: It’s Dancer’s Choice, this is what the dancer’s want to do and we are all really excited about it, especially because we are all so invested in Artist Relief Fund. This is by us so that we can help each other in times of need and it’s because of that that we are putting our full soul into it – I mean we always put our full soul into it, but especially for this one. Abby Phillips and Jackson Dwyer for Artist Relief Fund. Session Art Directors: Amber Lewis and Alison Remmers. Photo by Ron Brewer Images. Created in 2013 by former Ballet Arizona dancers Kenna Draxton and Joseph Cavanaugh, Artist Relief Fund (ARF) is a 501 (c)3 non-profit organization that provides support to Ballet Arizona dancers during their careers and beyond. Since 2013, ARF has raised over $100,000 and has contributed over $40,000 for financial emergencies and college tuition for the dancers. The mission of the Artist Relief Fund is to provide the dancers of Ballet Arizona financial support in times of injury, personal hardship, and career transitions while sharing meaningful relationships that enrich and educate the community. What a fabulous article!! Tremendous insights from our dancers. Can’t wait to see this on Saturday! Thank you for sharing.